Many of us tend to forget that our smartphones are not only fun and entertaining gadgets, but also powerful and helpful tools. For those of us juggling a busy schedule, it’s not always easy to keep track of all your meetings, tasks, projects, plans and memos. How efficient you are at keeping your life organized depends on which Android task manager you use. Among the slew of different Android organizer apps, Wunderlist appears to be gaining a lot of publicity in the media and popularity among my friends and coworkers. If none of the other Android task managers have convinced you to dump your old pen and notepad, can Wunderlist do the trick? Find out in today’s review! There is definitely no shortage of organizers and task managers for Android users. The problem is finding one that is quick, efficient, simple and easy-to-use. Today users expect a certain number of basic key features from their task managing apps: instant synchronization, a complementary web client and multiple sharing capabilities. Wunderlist manages to offer all of the above and more. When you start up Wunderlist, you’ll be asked to create a Wunderlist account by providing an email address and password. Although it is possible to use Wunderlist without an account, you will not be able to save and synchronize your tasks across multiple devices and computers. After the quick and painless registration procedure (shouldn’t take you more than 2 seconds), you start off with just one task list called Inbox. 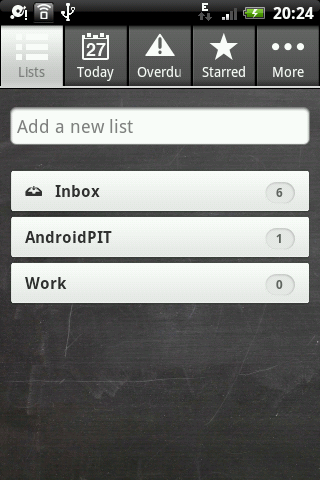 In your Inbox you’ll find six preset default tasks that explain the basics of how to use Wunderlist as a task manager. In Wunderlist, you can create customized lists with specific tasks. 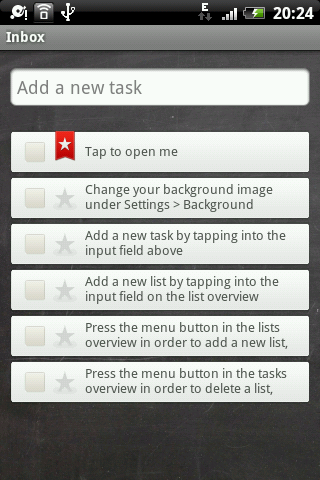 Tapping on each list opens up a screen where you can add as many tasks as you please. While adding tasks is a breeze, you’ll have to edit each task in order to add a reminder or date. By default each task is added without either of those things. Speaking of reminders, Wunderlist can remind you of things on your to-do list by sending you an email. You can set the specific time and date when to receive a reminder about a specific task. There is no integrating task alarm as is the case with other task managers. Personally, I actually like the fact that my phone doesn’t ring every 10 minutes to notify me about things I need to do. Emails are, in my opinion, both discreet and effective. Each one of your tasks can be prioritized by tapping the star symbol. All your most important tasks are then displayed under the Starred tab. In addition to the user-friendly app, there is also a Wunderlist web client that uses cloud technology to synch and backup all of your lists and tasks. The web client is basically a carbon copy of the app albeit with a couple of small additions. For those of you used to carrying a hard copy of your to-do lists and tasks, Wunderlist allows you to print out your lists on your computer. Sharing your lists with others can only be set up through the web client. You can either invite your friends and coworkers to join Wunderlist or generate a secret URL that can be shared with non-Wunderlist users. Just click on the small cloud icon at the top right of the page to see the URL. Everything is very simple and easy-to-use without any unnecessary layers of extra features. The synchronization works perfectly and allows for cross-platform integration. All your tasks can be accessed from any smartphone, tablet or computer – regardless of the operating system. This is definitely a big plus for the average office worker with multiple devices both at work and at home. Although generally a solid app, I wish Wunderlist would include status bar notifications in addition to email reminders. Despite all the hype around this task manager, it still isn’t the clear frontrunner in productivity apps. Hopefully, we’ll see new and useful features in the upcoming updated versions. In terms of style and appearance, Wunderlist does a pretty good job. You can select among several different background pictures – all of them are well-designed. When compared to the web client, the app version of Wunderlist seems rather bland. All the tasteful graphic design that was put into the web version appears to be missing from the Wunderlist app. If you’ve developed a good look for the website, why not transpose it to the app? The basic layout is pretty straightforward and is made up of six medium-sized tabs. 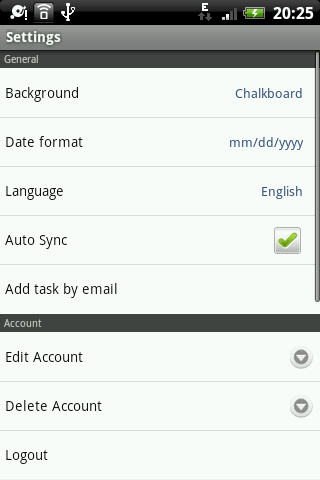 You’ll have to tap the Menu button for adding and deleting tasks. Although the app is generally responsive, there was a small glitch with checking off tasks on your lists. Tapping the checkmark next to each task doesn’t always mark off that specific task and opening the edit screen instead. A bit frustrating, but not a big deal on phones with bigger screens. A stable and reliable app that synchs all the tasks instantly. Wunderlist opens immediately and doesn’t take any time to load – a must for quickly adding items to your list. A small yet persistent problem that I noticed: it took the app a while to actually change the background picture after I selected one in the settings. Not sure if this is a weird glitch or something other users have experienced (feel free to share your experiences in the comments). Wunderlist is available for free from the Google Market without any ads.